As a young doctor, Nate Lester found himself in his small town with no mentors and an amalgam filling to finish. Dr. John and Wendy talk with Dr. Nate Lester about how he went from a first-generation college graduate to producing more than 4 million dollars this past year. His patient and community service are astounding and that results in incredible profits. Listen in to hear how he, and YOU can double your practice production tomorrow. [music] Welcome to the W Production podcast with the Team Training Institute. The one place designed for dentists and their staff who want to grow their practices by following in the footsteps of those that have done it, who are in the trenches, who know exactly what you are going through. And now your leaders, the stars of the podcast, Dr. John Meis and Wendy Briggs. Hey. Welcome everybody to the W Production podcast. This is Dr. John Meis. I’m here with Wendy Briggs. Hey, Wendy. Hey, Dr. John. How are we? 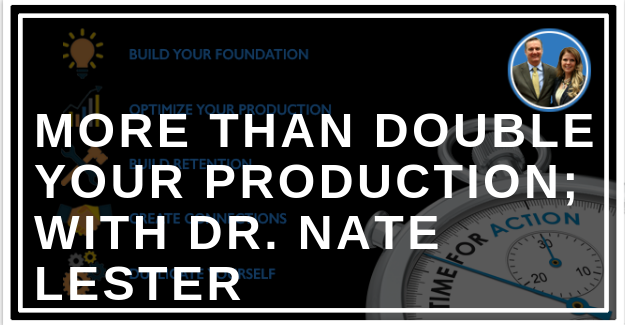 We are doing awesome today, and I’m so excited because we have a guest on our podcast today and our guest is Dr. Nate Lester. Dr. Lester practices in Evanston, Wyoming at Bear River Dental and his story is amazing. So we name this podcast W Production because we help practices do just that. And so Dr. Nate Lester’s story is– it goes far beyond that. And so Dr. Lester, how are you doing today? I’m doing great. Thanks for having me on today. No, thanks for being here. So kind of give us a snapshot of kind of how your dental career started. Okay. Well, as I decided to go into dentistry, I’m the first graduate actually in my family from college. My family comes from a long family of ranchersBranchus. My dad, ranchers, he was a mechanic. They’re very smart people. I don’t want to say they’re not educated people because they’re educated in different ways than we are. But they– that was my background and my upbringing. And I chose dentistry as a career, I did not have a mentor, someone to fall back on, on how to run a practice. And I knew I wanted to come back to my hometown of Evanston. I wanted to live close to the ranch, help them on the ranch and have my kids actively involved on that to help raise them. So as we chose Evanston, I found this, a nice little practice that was for sale. And we went through the– all the buying. Hard work was the gentleman that I was buying the practice from and we finally got to where we were ready to close. And I walked in one day, and then the last piece was the building and I’d been to the title company and signed the last document. Then I walked in and said, “Doctor, we got everything taken care of. I think that was the last piece.” And he kind of smiled and he rolled his chair back and he pulled his keys out of his pocket and dropped the key to the office in my hand and said, “I’ll leave the information upfront where t send my cheque.” And he walked out the door and that was it, he was gone. And I’ve still to this day, I’ve not seen him again. And there I was with one assistant and a patient that was numb, and I asked her, “What are we doing today? And she said, “Yore doing an [inaudible] number two and amalgam. And I almost died because I didn’t like number two, too far back there. I’m straight out of school and I didn’t have my loops on and I thought, “I can’t even see the two. But we sat down, we finished the procedure and we walked to the front and I said, “Now, how do we bill them?” And she said, “I don’t know. He did all that.” And so we begin. And it was a rough start. We quickly recognized we needed try to hire people in the industry. We stole a few people ffrom– or made offers to people and they graciously came and helped us get started from other practices. And I knew in mymond that this is going to be a learnign curve as far as thebusiness side of dentistry. I felt like I had interpersonal skills. I have a love of service, I have a love of learning dentistry, but the business I needed help in. My friend, Dr. [Prince? ], he’s about an hour down the road, and Dr. [Prince?] had a dad who he could consult with. His dad was not practicing, but at least he had a consultant. So I spent a lot of time on the phone, and Dr. [Prince?] got to the point where he was chasing consultant after consultant. And the nice thing for me, as I wasn’t paying them, I was just looking over his shoulder and saying, “Hey, buddy, what are you doing down there?” And what I did is, I learned quickly that not every consultant had all the answers. Sometimes, they would try to fit all of us into one box, and they would say, “You have to [practice?] this way to be successful.” And they’d almost even insinuate that if you don’t, you won’t be successful. And I struggled with that because poor Dr. [Prince? ], he’s trying to do everything they’ve told them, he’s working his tail off to do it just right, and I would come in and just pick the things out that I felt like would be beneficial to me and my practice. And it really was a benefit to us to not be stuffed into the one box that he was trying to fit himself into. And I soon learned the importance of mentors, and that’s kind of where my journey was started. We bought a practice that was doing about a half a million, we got it up to 700,000 just through trying hard. But I knew there was more to do, I just didn’t know how to do it. So that’s kind of where my journey began. Yeah. That’s such a great story. I loved the dropping the keys in your hand with the patient [numb?] right there [laughter]. [inaudible] probably the best way to handle a [inaudible], but he was obviously emotionally done. He was done, yep. He was ready to check out. So that wasn’t maybe his finest moment, but that’s what happens. So really, a cool story, and I loved the piece that you were talking about with a one-size-fits-all approach isn’t necessarily good. And I would say most often that’s not so good. One of the challenges that corporate dentistry has is that they’re trying to fit everybody in the same box. And so we joke sometimes that corporate groups are good at taking a mediocre practice and making it good, but they’re also good at taking a great practice and making it good because they try to fit everybody in that one box [that?] doesn’t necessarily fit, it doesn’t necessarily perform as well as what you did which was really cherrypick ideas, identify the things that are going to help you progress your practice and your style. And your practice is very different than any your area. I mean, you’re the absolute cream of the crop of practices in your area, and I think that’s how you got there. [inaudible] picking the key pieces [inaudible]. So Dr. [inaudible], and you really [took?] us up to where you were, you’ve got about $600,000 a year. But I think what’s missing is what happened next, right? You got to let everybody know what the next step was when we met one another and then what happened, because today, you’re so far ahead of that $600,000 a year. Just so everybody knows, do you mind sharing with us what your revenue or production was for last year? [crosstalk]. We’re just over 4 million, and we plan on doing– we’re on track to do 4.3 this year. I see. That’s why you’re the head of the [inaudible] [inaudible]. So I’m sure people are wanting to know, “Okay. Wait a second. How did you get from 600,000 a year to 4.3?” Right? Because this is the Double Your Production Podcast. And what’s nice about what we do is we actually have helped the doctors do that. It’s more than just a catchy title. So tell me a little bit about the next chapter – right? – in your story. Yeah. So the next chapter, my chapter with Dr. John and Wendy, all started about the same time they found each other. And I had an opportunity to hear Dr. John in Arizona as he was meeting with a different group, and I had heard Wendy, independent from Dr. John. But within a month, the two of you had found one another, and I thought, “Oh, my goodness. Could this be any more ideal for me?” Because I had a hygienist that had gone and heard Wendy at the Utah Dental Meeting and came back and said, “Hey. I think she can really help us.” And I will tell this the way dentists think. We think that if we have to spend too much money, or any money, then, it’s probably not worth it. When I found out what the cost might be to work with Wendy, I thought, “Man, I don’t know if I can afford to do that. I just feel like I’m going from month to month.” But I also recognized that the more you can spend and learn, the better your return is. And so we decided we’re going to do that. This is the best money we had spent. Wendy and her team came in, and we literally, in the first week, had doubled or tripled our production in our hygiene department. And we have just increased it ever since. I’ve actually been a part of TTI for eight or nine years, now. And people keep asking, “Why do you keep going? Have they not taught everything they could teach you?” Well, every time I go, there’s things that we glean and remember, and things that we can focus on and do better. And so it’s been worth my time and worth my money to continue to work with Wendy. Now, John. I met John about the same time, and in John, I saw somebody that had vision. I saw somebody who had had a desire and a why story similar to mine. Dr. John has had some health struggles early in his career that led him to feel like, “I need to do more for my family. I need to do as good in business as I possibly can.” And I have had a similar health scare, and I thought, “Hey. This guy did it. I can do it. I can learn from him.” And as the two of you came together, I had two ideal mentors for me in one team, in the team training. And I can’t say enough for how grateful I am for the two of you and finding good mentors. And mentors that didn’t try to say, “Hey. There’s only one way to do it.” Because one of the beauties of team training is I feel like I have a team of mentors, all the different offices that come together. As we come together and brainstorm and share ideas, there’s somebody in that room, whether it was Dr. John or Wendy – it may not have been either one of you that had struggled with the similar issue that I had been having – and answers came from a roundtable discussion or a Hot Seat discussion. But the driving force behind our success really came from the ideas that I would take away. And as I would get the ideas, then I felt like I had someone that I was responsible to, besides myself, for my own practice. I wanted to prove to the two of you that I could do what you were asking me to do. You can call it pride or arrogance, or just a desire to maybe just be a pleaser, but I wanted to please the mentors. I wanted to show them that you guys are great, and because of your greatness and what you teach me, I could be just as great. So we would leave each meeting and we would go home with a list. And initially, I screwed up. Initially, I’d go home with a list of 10 action items. And I quickly learned, 10 actions items is too many action items. So we have to– as a team, we have to decide, “What are three action items?” Let’s start with three, and we’ll put these other 4 through 10 in the back-burner, but let’s get 3 in. Let’s implement three, and let’s make it work. And we would come home and do it to the extent that at one point the counsel from one of the meetings was [inaudible], “You’re out of [capacity?]. You need a new building.” Okay? So I went and built a new building. And I doubled my chairs, I went from three to six. And I thought, “Wow, can I ever fill these chairs?” And six months later we’re at another meeting, and Dr. [Tom?] says, “I’m afraid you’re out of capacity.” And I’m thinking, “Oh dear, what do I do now?” So I went home and I knocked a hole in the wall of my brand new building and I added five additional chairs. And then, the next meeting, I said, “I knocked a hole in the wall. How are we going to fill it with these people? Was there anybody in your area that would maybe be interested in [inaudible]?” And so we did. We came home, the very next day– I got home on Saturday, on Sunday I’m knocking on a gentleman’s door that I thought was of age and was hoping to retire, and we bought his practice, and we were able to fill the chairs. So each idea, to us, was [inaudible] and it was those things that– it was having the courage to take what has been successful in other areas and not just from the two of you, but from the groups that you bring in and say, “We can fit that and make that part of us.” So one of my key– if I was to say, one of the key reasons that we have doubled – well, more than doubled – is we found the right mentors. We found mentors that said, “Hey, we’re not going to force into a box, but we’re going to teach you how we’ve been successful. You can cherrypick from us and you can cherrypick from everybody in this group, and you will find success.” And we did. That’s how we doubled our production. One of the things that– anybody who is listening to me for any length of time, I will always talk about the practices that do extremely well, their leaders have two qualities [inaudible] consistent across every practice that does well. Number one, they are decisive. They make a decision. They don’t put something on the shelf to think about it, and think about it, and think about it. They gather the information that they need, and they make a decision. And the other thing is, they act quickly. And so I remember that first meeting where we were talking about capacity. I think you were on the phone with builders and whatnot before you even left the meeting. I mean, when it comes to implementation, you and your team are really just world-class at it. When you decide to do something, you go after it and you lead your team in getting it done. It’s awesome. So one of the other things that I’d like you to talk a little bit about is that you really were very serious about what your community needs. And so you were always thinking about [inaudible] consumer, how can we serve the [inaudible] consumer better. So those of you who aren’t familiarr with Evanston, it’s about — what is it? A couple of hours east of Salt Lake City in Wyoming? Yeah. So what we did is– [and it?] and again, this idea came during one of our quarterly mastermind meeting that we were holding in Arizona. I thought why am I giving away production and why am I not meeting the needs? And I have two ways that I can do this. I can either take CE classes, and I can learn to do all the [thirds?]. I already was doing some of that. I was doing some of my [implant?]. I was doing all of my endo. And I started recognizing areas in my schedule that were taking more of my time that could really be done by a specialist. But I have people that don’t want to drive to Utah. They don’t want to have to drive down there and take– really it becomes a whole-day adventure to go down and take care of things and come home. And so the idea we came up with was let’s see if we can’t find specialists to bring to us. And so, we contacted an oral surgeon. And we found two fantastic oral surgeons that both were interesting in coming. And so what they did is they formed a partnership. And that way, neither one of them are out of their practice more than they want to be. So they take turns coming up, and every other week, every other Wednesday, I have an oral surgeon here at the office. That led me to an endodontist because yes, I was doing my own endo, but I was also recognizing it as I think there’s somebody that can do it maybe faster than me. He uses a scope to do it. And that’s all he does every day. And so I swallowed my pride and said, “Maybe there’s something to his abilities versus my abilities.” And so I’m going to see if I can’t bring in an endodontist. And so we did. He comes once a week. And he brought a scope with him and is a tremendous asset to our community. Just the comradery we have, but then also being able to listen and learn how they diagnose versus how I was diagnosing was a great education to me. And I’ve been asked by other doctors, “Wasn’t that a pain giving up that high production?” The reality is because I’m taking home a percentage of what he does, I’m not losing the production if I was sending it to them anyway. And now I’ve got an hour and a half free crank out more dentistry. And so I have not seen that to be a loss of production in any way. It’s been a tremendous benefit. And then we brought in an orthodontist as well. For people to take an hour and a half to get to Salt Lake back and forth, it takes a lot of time. And we had one gentleman that was coming to our community, and he was only here one day a week. And he’s at capacity. And so we felt like we could compete or add to without really being a detriment to his practice. And we’ve been able to do that with an orthodontist. And he comes between four and six times a month, depending on need. So those are the three specialties that we are able to bring in. We are hoping to do something with sedation, but our state is very difficult to get any sort of sedation going. And so what we ended up doing there is we made a relationship with the local surgical center. And once they saw that we were going to be successful and we were going to be consistent in bringing cases, they’ve offered me ownership in the surgical center. So now every case we do, we’re getting a little ownership and a little return on our ownership in the surgical center. And so we’ve tried to meet the needs of the community by bringing people to them so they’re not having to travel to get to the specialists. What I love about this– what I love about this, Dr. John, if I could just interject. I love the fact that initially and I think it’s still that way today. You branded it as a separate practice. So it was a specialty practiced within your practice, essentially so that you also not only served the needs of your patients, but you had other dentists referring their patients that had specialty needs to this specialty practice. And so I think that was such a brilliant strategy on how to structure in that way that you are able to, certainly grow your own existing practice, but you rebrand it– you had a separate brand, essentially. We did, yep. We named it Wyoming Dental Specialties. And we do our best when– if you were to call the office, we answer the phone as Bear River Dental and Wyoming Dental Specialties. Our treatment plans go out stamped as Wyoming Dental Specialties because I learned– specialists, they, I don’t want to say they get away with, but they deserve, through their school of education, that they’re going to charge some more on some things, and occasionally, that ruffles feathers with patients. “Whoa, why am I getting charged so much?” And they automatically say, “Well that place charges too much.” And it would look as if it’s Bear River Dental. And I’m like, “No, no, no, no, no, you’ve got to understand that– I try to sell it off as they’re just renting space from me, and as we help our patients and educate them that we just have visiting doctors and we’re just trying to provide a place for them to work, patients have come to understand that better. So making a clear separation between the two, we learned was going to be very important, and today, it still is very important to us. To make sure that they’re two separate and distinct practices. One of the things that your experience helps demonstrate is the principal of wages versus profits. Wages are what you’re earning from your own two hands, profits are what you earn from others, and so you just identified, all right, so I changed my production, but now I’m getting both wages and profits, and now the surgery center, there’s another source of profits. And eventually – you’re a young guy – but eventually, those profits are going to exceed your wages, and that’s when you’ve got a real business. And you might be getting close when you get the additional pieces that we’ll talk about here in a minute, in place. You’re going to be getting close. And it’s a very good day when that happens, let me tell you. Yeah, it is a good day. And it’s a good day just knowing that all of– if you look at my wages, my wages really come to us because they’re profits that’s covering the overhead of the practice. And so to know that if I look at– as I transfer money every month from Wyoming Dental Specialties, there’s enough to cover all of the expenses of Bear River Dental. And so that’s a nice day to know as I work, my wages are increasing because of it. Yeah, that is a great way to look at it. So you’ve got big plans. So let’s hear what’s next. So next, we wanted– we’re ready to get into multiple practices. And we kind of tried it as we bought the second practice – the second location – from a doctor here in our town, but in a small community no bigger than what we had, we learned quickly that our patients wanted to continue to be seen in our nice, new, beautiful building with lasers and [Cerex?] and everything else, and they didn’t want to be transferred to the second location. And when patients from the second location found out that they could come here and they weren’t stepping on anybody’s toes or hurting feelings, they also wanted to be here. And so, a second practice location here in our town proved to be difficult, given our size. And so that’s when we did the merger added on and fill chairs that way. Now we’re looking into a second location that will be 45 minutes from us. So through due diligence, we felt that given the population and the number of dentists that were actually even adding us, we’re going to be in a better situation than what we find ourselves in here in our own town. So we’re going to do a new startup and we talked before, that kind of comes– there’s some good and bad that comes with that. Some challenges [inaudible] getting the building going, challenges with some of the financing. You would think with as well as our practice does and having the equity we have in our building, and our personal credit, and our business history, that that would be an easy thing, but sometimes it’s not. So we learned that dealing with private investors was going to be easier than dealing with banks. There’s a lot of lessons to be learned in growing that second practice. So that’s where we’re headed next. We have a young doctor that we’ve hired. He’s moved to the area, he’s getting to know the community. He loves the community. He’s a Wyoming-raised kid and so is his wife. And they’re just so excited to be here and we feel like we’ve struck goals with him. He’ll be a tremendous asset. We have him coming in and working with some of us now. So he’s spectacular. And those spectacular guys are out there that really could do it on their own. However, given student loans, the debt load, and also some of the banks, they’re being a little bit finicky with getting some of these young doctors’ money. It’s a difficult start for them. And one of the things we’ve been able to show him is we want him to be a partner in that practice as quickly as we can. Hopefully within the first year, once we make sure we’re all compatible. But that if he follows our systems, which we will give him every system we have, he will be way more successful than trying to do it the way we did it, and hopefully we will grow that practice much faster. I know we will grow that practice faster with our input and help than what he could’ve done on his own. And so given that, to him it’s worth being a partner and taking a little less to ultimately get more. So that’s where we’re headed next, and we’re excited for that, and we should be breaking ground in the next week. So we’re ready to go. Yup. And another quality that I want to point out to you is you always have a sense of the bigger future. The what’s next. And not that you haven’t taken pauses from one stage to the next to let your capacity fill and let your team grow. Because you’re practicing dentistry, your team’s running the thing, and it takes time for them to grow, and to learn, and be able to manage something that’s bigger and complex. So your timing has been just really spot on. Well, and that has been– as you mentioned the team, I mean that’s another thing that as you call it team training institute, I mean it truly is. It’s not a doctor training institute. It’s a team training institute. And one of the first things that I gleaned from Dr. John was him having someone that he could call on all the time that he had whole faith in that could help with the practice, and having a qualified office manager. And I was doing so much of the work on my own, that I thought, I can’t give that up. There’s that control piece that’s hard to recognize, that you’re too controlling. You’re holding yourself back by having too much control. And thereby [crosstalk] he interacted and you’re holding everybody else back. And so once we kind of figured that out, wow. I mean, people are asking me, “How do you possibly do it as much as you do it in that small town?” Well, I don’t. I just sit down and do dentistry. I don’t do anything but I just sit down and go from chair to chair. They do it all. And I have very competent– and I want to call them well educated because they’ve done team training. They go to meetings. They participate. They come up with big ideas. They’re proud when they have big ideas when they’re actively seeking for systems that improve us. And I think one of the– if I just point out another lesson that you all taught me that helped us to double is that of turn stuff to staff and have faith in them and guide them. If they helped develop it and create it, they’re much more likely to do it. For sure. People support what they help create. Wendy, did you have anything more for Dr. Lester? Well, I mean, obviously, we just think the world of you and everything you’ve accomplished. It’s been really fun to see your growth and your progress along the way and even the progress of your team. Your hygiene team were doing things so far and above the average in the country and I would say [inaudible] definitely said it right when he said, “Your practice, your team. They are the cream of the crop.” And so we’re super excited for where you’re going and very proud of all you’ve accomplished along the way. And that also includes your team members. We’re really proud of what they’re doing every day as well. Just like you’ve said, “Teamwork makes the dream work.” and it’s certainly something you can’t do on your own. But it’s been a privilege to be involved with you and watch your growth and we’re really excited about where you’re going. –what you’ve helped us do. Yeah. So anyway, we know where the help has come from. We would forever speak very highly of the two of you. Yeah. Well, we obviously speak highly of you and really, like I’ve said, you’ve done a fantastic job of making decisions and implementing them [inaudible] quickly and that’s the secret. All right. Well, thanks so much, Dr. Lester. It was great to spend some time with you today. Again, congratulations on all your success and good luck in your new endeavor. I know it’s going to go as smoothly as it can because of your great leadership and the great team that you’ve built. Awesome. Thanks so much for being on today, Dr. Lester. Bye-bye. And that’s it for this episode of the Double Your Production Podcast. We’ll see you next time.